VRF, meaning Virtual Routing and Forwarding, is a technology implemented in the IP network routers that allows multiple instances of a routing table to exist on the same router in the same time. Since each VRF is independent, the same IP subnet can exist in 2 different VRFs. Basically you can overlap one IP address in 2 VRFs but without conflicting with each other. Even this is possible, I would not suggest doing so, unless you have a very good reason to do it. 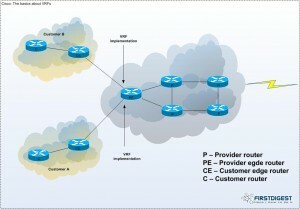 To summarize, virtual networks enable administrators to split a physical link into multiple virtual links completely isolated one from the others. Typically, a virtual network will be dedicated to traffic from a specific application or from a specific users / customers. As you can see from the topology, one PE router can hold and manage multiple virtual routing table, one for each customer that an ISP have. If you are running in a private environment (e.g. Intranet), you can use MPLS VPN to separate services (e.g. office, development…) The basic functionality is the same and I’ll show you below how to implement VRFs. The actual configuration of VRFs is not a complicate task to achieve. There are two main components to a VRF: The route distinguisher(RD) and the route target(RT). The route distinguisher (RD) is a number which help identify a VPN in a provider’s network and allow for overlapping IP space. The route target (RT) indicates the VPN membership of a route and allows VPN routes to be imported or exported into or out of your VRFs. The RT functions a little like a routing policy — determining how routes are distributed throughout the particular VPN. Usually the first method is used more often. 1. Enters VRF configuration mode and assigns a VRF name. 3. Creates a list of import and/or export route target communities for the specified VRF. 4. (Optional step) Associates the specified route map with the VRF. 5. Specifies an interface and enters interface configuration mode. 6. Associates a VRF with an interface or subinterface. In some of the following posts, I will present a VRF implementation following a real environment topology, but until then I hope you understood the basics of VRF functionality. It’s not hard to implement (from case to case it might be due to local topologies and technology) but it can help you to have a more granular connections and makes troubleshooting more easy, especially in the environments which have a lot of IP addresses under management.